Commercial fruit trees usually consist of two parts, the scion (the fruiting variety) which makes up most of the tree that you see above ground-level, and the rootstock which – as the name suggests – consists of the roots and lower portion of the trunk. The join or “union” is easy to spot in a young tree – it is the kink a few inches above the ground where the scion was budded or grafted on to the rootstock. This marriage works because rootstocks are very closely related to scions – thus apple rootstocks are apple varieties in their own right, but where the main attribute is not fruit quality but tree size. Plum rootstocks can also be used for apricots and peaches, which shows just how closely these species are related. Most rootstocks will produce edible fruit if left to grow naturally, but the fruit is usually small and poorly flavored. The variety selected for the scion imparts the fruit characteristics such as size, color, and quality factors. The variety selected for the rootstock determines tree size, precocity, some disease resistance (such as fireblight) and even cold hardiness. And like the fruiting varieties, rootstocks also undergo breeding and selection for their desired characteristics. Whilst most scientific attention has focussed on developing rootstocks for apple trees, rootstocks are also important for growing pears, plums and cherries. The most common rootstocks used for apple, pear, and sweet cherry are listed below. Click on the crop heading to view the related rootstock information. Summary written by Tianna DuPont, WSU Extension Specialist. Rootstock information from Tom Auvil. Growers often ask which is the ‘best’ apple rootstock. The replant tolerant Geneva rootstocks (G.11, G.41, G.214, G.935, G.210, G.969, G.890) are much better than the available standards of Bud 9, Mark, M.9 clones, M.26 and the semi-dwarf rootstocks. But, which rootstock you use depends on your site, goals and scion. Years of experience will show us which scions will do better on which rootstocks in a given site. Try multiple rootstocks in your site to see which combination is better in your particular location. Here are some considerations from the Washington State Tree Fruit Research Commission trials and recent tour. England’s East Malling Research station gathered selections and determined trueness to name. Finding many misnamed collections of plant materials Dr. R. Hatton properly divided the 24 selections found and assigned them a Roman numeral. These numerals were not in order by tree size and thus M.9 is smaller than M.2. Of this group M.9, M.7, M.2, M.8 and M.13 have been commercially important in the US. In succeeding years M.26 and M.27 were developed from controlled crosses. In 1917 the John Innes Institute of Merton England joined with East Malling Research Station with an effort toward developing woolly apple aphid resistant rootstocks. Of these Malling-Merton rootstocks, the MM.106 and M.111 are still widely used. In the 1960’s East Malling and Long Ashton research stations in England worked to remove viruses and the resulting incompatibility problems from rootstocks. The resulting ‘cleaned up’ rootstocks are the EMLA group. Since this time most modern rootstocks have had viruses removed. New rootstocks are being developed the first of which was the Budagovsky series designated Bud or B. The newest rootstocks being developed and released are the Geneva series from Cornell University’s breeding program. The Washington Tree Fruit Research Commission (WSTFRC) installed Geneva rootstocks trials in three locations with multiple scions in order to evaluate rootstocks in multiple soil types and growing conditions. Trees are managed by growers to approximate their normal growing practices. Trees are now in their third leaf. This fall, fruit evaluations will be conducted, allowing for observations on fruit yield and quality. This trial is meant to complement the national NC140 rootstock trials. Bud.9 is a newer dwarfing rootstock bred in the Soviet Union from the cross of M.8 x Red Standard (Krasnij Standart). 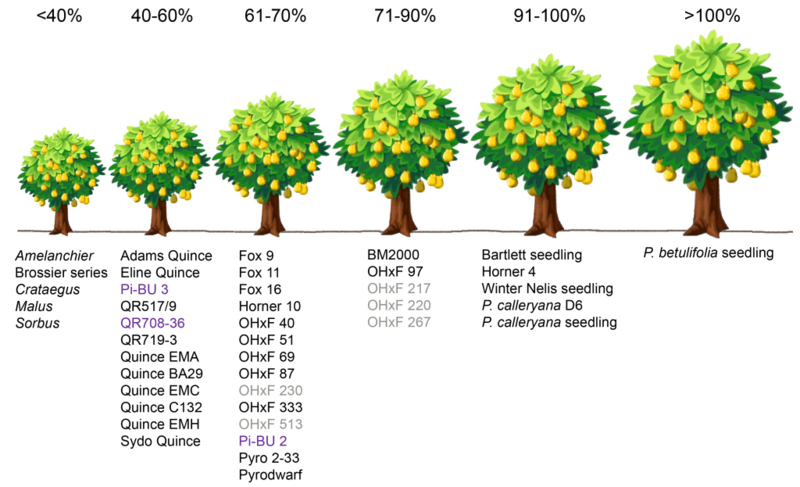 Trees in this series are 15-25% smaller than M.9 depending on the cultivar and site. B.9 appears to be resistant to collar rot and very cold hardy. Malling 9 (M.9) is the industry standard for dwarfing rootstocks. Numerous clones of M.9 are available from nurseries including the M.9.337 clone used in this trial. Size/vigor: In trials, M9.337 is considered to be 30% of seedling with the same scion and site. Pest/disease resistance: M.9 337 has low replant resistance, no fire blight resistance, no wooly apple aphid resistance and high crown/root rot resistance. G.11 has the most history of the Geneva rootstocks. For example, McDougall and Son’s Legacy Orchard has 8th leaf trees on G.11 that are performing better than M9.337. Size/vigor: Geneva 11 is considered an excellent M.9 replacement. It does well in loam and clay-loam soils. In sandy soils, it must be planted closer together in order to fill space. Disease/pest resistance: G.11 is not woolly apple aphid resistant. Replant resistant. Crown and root rot resistant. Moderately resistant to fire blight1. Nursery performance: Stable. Disadvantages: Less tolerant to growing in sandy soil. G.935 is the most precocious of the Geneva series in these trials. It is a 1935 cross of Ottawa 3 and Robusta 5. Size/vigor: Semi-dwarf reported to be slightly larger than M.26. Production efficiency rated equal to M.9. Disease/pest resistance: It is not resistant to woolly apple aphid. It has fire blight and crown rot resistance. Nursery performance: Very good. Disadvantages: Some new plantings have experienced decline. There is no confirmed evidence of hypersensitivity to viruses. Currently researchers are investigating the cause of the decline. Viruses are under suspicion in the decline of G.935 trees based on some association between declining trees and the presence of viruses. In New York both apple chlorotic leaf spot virus and apple stem pitting virus were present in declining trees on G.935. However, in Washington some declining trees tested have tested positive to one or the other virus and others have not. Apple chlorotic leaf spot virus and apple stem pitting virus are extremely common in Washington and often cause few symptoms. A new luteovirus is also being tested. Remember, association is not causation and until further research is conclusive we cannot say what is causing the decline. Research trials are underway at both Cornell and Washington State University to address the decline. Growers should be extremely cautious with G.935 until this issue is further understood. G.214 is in the M.9 337 size class with fireblight and wooly apple resistance. Size/vigor: G.214 is similar in size to G.11 and G.41 in the M9.337 size class. In TFREC trials it had reasonable croploads in 2nd and 3rd leaf trees indicating potential for precocity. In all three blocks, trees were above the top wire. It filled canopy and grew well. Disease/pest resistance: Replant and fire blight resistant. Wooly apple aphid resistant. Nursery performance: It is nearing commercial availability. Disadvantages: Availability is low due to prior problems with mislabeling of foundation material shipped to tissue culture companies. M.9 Nic 29® is 20-25% larger than M.9 337 (25 to 40% of seedling). Nic 29® is a Malling 9 type rootstock. Size/vigor: It usually exhibits a better root system than M.9 337 or M.9 EMLA. Of the various types of Malling 9, Nic 29® exhibits stronger vigor, yet is still a full dwarf. The rootstock is both precocious and productive, usually fruiting in second or third leaf. Disease/pest resistance: Highly susceptible to fire blight. No wooly apple aphid or replant resistance documented. Disadvantages: Root death from fire blight infections before scion symptoms are present. G.969 is in the large M.9 group of dwarfing rootstocks in Washington trials. Size/vigor: It is classified as having growth between M.7 and MM.106 in prior Cornell trials. More recent trials from Terrence Robinson at NYSAES Geneva, have transitioned the G.969 classification to significantly smaller. In TFRC trials it was in the size class of Nic 29. Disease/pest resistance: Fire blight, crown rot, and woolly apple aphid resistance. Nursery performance: Excellent, best of the Geneva family. Disadvantages: Lack of experience with scions, sites, and growers. G.935 is the most precocious of the Geneva series in these trials. However, some new plantings have had problems that might be virus sensitivity and it should only be planted with fully virus screened scions until the issue is further understood. It is a 1935 cross of Ottawa 3 and Robusta 5. Size/vigor: Semi-dwarf reported to be slightly larger than M.26. Production efficiency rated equal to M.9. Disease/pest resistance: It is not resistant to woolly apple aphid. It has fire blight and crown rot resistance. Nursery performance: Very good. Disadvantages: Virus sensitivity was not demonstrated in known virus trials. Should be planted with virus-free scions or scions with several years of good results on G.935. G.890 is a larger rootstock. It seems able to scavenge for water and nutrients making it a successful replacement tree rootstock. It is considerably more precocious than Malling stocks of similar vigor. Size/vigor: G.890 and G.210 are the most vigorous of the Genevas. Size is similar to an M.7 but with higher and earlier production. In the TFRC trial, G.890 with fruit was bigger than G.210 without fruit. Resistance: Resistant to fire blight, crown rot, and wooly apple aphid. Nursery performance: Very good. Disadvantages: It is vigorous. Tips for working with G.41. G.41 has had some problems with trees breaking at the union of the scion and the root. This brittleness is associated with high rigidity. Most of this injury happens in the nursery but at the field day, Auvil explained some ways to prevent injury at planting. First, “Don’t buy big trees.” Bigger trees are more susceptible to breakage. “Buy ½ inch whips if you can.” “ ½” whips have very few problems and can be planted mechanically,” Auvil explained. If you do buy larger caliper trees it is important to handle them gently. Build your trellis before you plant. Clip your trees to the trellis as you go and be gentle as you handle the bundle. “Instruct your crew to lift trees with two hands,” Auvil reminded the group. Damage can occur as they untangle the trees. The NC-140 group has also found that BA applications directly to the graft union increased break strength2. Apogee also increased strength but reduced scion growth. Freestanding trees? Participants asked which rootstocks could be freestanding trees. Auvil reminded them that free standing is a cultural practice, not a rootstock trait. Any rootstock in the trial would have to be headed back multiple times to create a free standing tree. Rootstocks that have good anchorage can be cultivated into free standing. Pruning, especially to develop free standing trees, will significantly delay fruiting. Availability. G.11, G.41, and G.935 are widely available, however demand is larger than supply. Other Genevas are available in smaller quantities and by pre-arranged contractual agreements. At the present time most of all the dwarfing rootstocks have pre-arranged contractual agreements in place. It is best to reserve your rootstock for the future as soon as possible and then determine the variety you want on it prior to budding. Favorite? Scott McDougall and Auvil explained that G.41 is the best all-around rootstock available right now. It has replant, fireblight, and woolly resistance and has performed well across soil types. G.969 looks like it will have a good future as growers gain experience with the very new rootstock and will be a good Nic 29 replacement. G.969 is easier to plant and stands up nicely in the nursery. 1 In Cornell trials G.11 plants inoculated with fire blight developed 25% infection under high inoculation pressure with one of four strains of E. amylovora. Attributes: Adapted from information provided to the Good Fruit Grower by Tom Auvil and Dr. Gennaro Fazio, Feb 2016. Figure 1. Third leaf Pzazz trees in new ground in Brewster WA, August 2017. Figure 2. Third leaf Honeycrisp trees in a non-fumigated old orchard site in Oroville WA, August 2017. Third leaf Honeycrisp in new ground in East Wenatchee WA, August 2017. Penn State Tree Fruit Production Guide. 2016. The majority of commercial pear trees are grown on rootstocks. Pear rootstocks impart characteristics such as vigor, precocity, disease resistance, and cold hardiness. The most commonly used rootstock worldwide is some selection of a Bartlett seedling, making it the “standard” rootstock. In rootstock trials, rootstock test scores are often expressed as a comparison to Bartlett characteristics. For example, the test rootstock may impart dwarf characteristics as 70% height compared to a Bartlett seedling tree. In North America, the most common Bartlett-type rootstock is OHxF. OH stands for “Old Home”, a name given to a seedling selection discovered in Illinois by Prof. F.E. Reimer of OSU. It was found to be resistant to fireblight, but was self-infertile. The “F” stands for Farmingdale, the town in Illinois that Reimer discovered the second Bartlett selection. Like OH, it had fireblight resistance, although not quite as good, but it was self-fertile. Old Home and Farmingdale were crossed by L. Brooks of Oregon and the resulting offspring were fireblight resistant, self-fertile, vigorous and had good cold hardiness, making it desirable as a rootstock and receiving a patent in 1960. The graphic above illustrates the overall influence on tree size* by various rootstock combinations compared to a Pyrus pear seedling. Key to abbreviations and names: BM = P. communis series from Australia; Brossier = P. nivalis series from Angers, France; Fox = P. communis series from the University of Bologna in Italy; Horner = OHxF clonal series from D. Horner (Oregon nurseryman) and selections by OSU-MCAREC; OHxF = ‘Old Home x Farmingdale’ series; Pi-BU = Pyrus series from Germany; Pyro and Pyrodwarf = P. communis selections from Germany; QR = P. communis selections; ‘Adams’, ‘BA29’, ‘EMC’, ‘EMH’, ‘Sydo’ = Quince dwarfing rootstocks (require interstem for most pear cultivars). Selections shown in gray text indicate antiquated selections no longer in commercial production. Selections shown in purple text indicate possible susceptibility to pear decline. 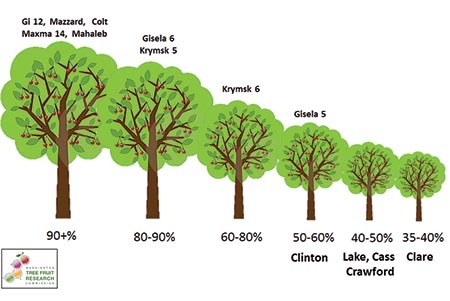 *This general classification of tree size may vary for different cultivars due to cultivar/rootstock interactions. This graphic was adapted from the article by Elkins, Bell, Einhorn, 2012, J. Amer. Pomol. Soc. 66(3):153-163. Pear varieties growing on OHxF or any Bartlett seedling rootstock tend to be large, non-porous trees. In order to get trees that are more suited to high-density plantings, rootstocks with dwarfing traits and precocity need to be used. In many parts of the world Quince selections are used as rootstocks. This combination will result in dwarfed growth and precocity. However, Quince is not compatible as a rootstock for many varieties of pear such as Bartlett, Bosc, Forelle, Packham, Triumph, Winter Nellis and Eldorado. For these varieties, the use of an interstock (intermediate graft section) must be used. Another problem with using Quince is that most varieties are not winter hardy making it a poor choice for the Pacfic Northwest. However, there are ongoing trials at OSU testing potential Quince selections exhibiting good winter hardiness (Einhorn’s work). Descriptions of some of the more commonly available pear rootstock. Hardy seedling rootstock Van Well Nursery uses for pear and Asian pear varieties. Source: VanWell Nursery. ‘Old Home’ by ‘Farmingdale’ (OHxF) rootstocks, are a trademark of Carlton Plants. The OHxF series of rootstocks originated from crosses made more than 75 years ago by Reimer at Oregon State University. Reimer was looking primarily for rootstocks resistant to fireblight. Both parents are highly resistant. The work was further developed by Lyle Brooks of Daybreak Nursery and Dr. Mel Westwood at Oregon State University. This superior series of rootstocks are well-anchored and compatible with most varieties. Also, they are winter hardy, precocious and quite productive. Source: Cummins Nursery. A semi-vigorous pear rootstock, about 2/3 standard size. Resistant to fire blight, crown rot, woolly pear aphids, and pear decline. Precocious, well-anchored. Patented with a 50¢ royalty fee. OFxF40 is not very precocious and is not recommended to use with Bosc, which would result in fewer and small fruit. (T. Auvil, WTFRC) Source: Cummins Nursery. OHxF 87™ makes a tree slightly smaller than Bartlett on seedling root. It is considered a semi-dwarf tree. OHxF 87™ is one of the best producing rootstocks of the OHxF series and was selected for this reason. The OHxF selections are compatible with most pear varieties and are known for their tolerance to blight and decline. Research from Oregon shows OHxF 87™ is an excellent producer. OHxF 87 should be planted 6-8′ between trees within a row. It gives early vigor and is more precocious that OHxF 97. It is also best when paired with a vigorous variety such as Anjou. It is not good for interplanting with less vigorous trees due to competition for light. As a patented selection, OHxF 87™ is available only through selected outlets. Van Well offers this rootstock through a licensing agreement with Carlton Plants, Inc. Source: VanWell Nursery with additional comments by T. Auvil, WFTRC. A clonal rootstock of ‘Old Home’ x ‘Farmingdale’, this rootstock is resistant to pear decline and fireblight. It is a superior rootstock for vigorous pear trees. Hardy and resilient to cold. It provides good anchoring and yield efficiency. It is bet planted 8-12′ between trees within a row. OHXF 97 is less precocious than OHxF 87. Source: VanWell Nursery with additional comments by T. Auvil, WFTRC. PyroDwarf produces a tree 61% – 70% of the size of a seedling pear tree. It is an alternative to seedling rootstocks, as it produces large attractive trees which start bearing usually after 3-4 years. Being of Pyrus origin, there are no graft incompatibility issues with this rootstock. PyroDwarf is able to tolerate chalk / alkaline soils better than quince-derived rootstocks. PyroDwarf was developed from a cross between ‘Old Home’ (fireblight resistance) and ‘Louise Bonne dAvranches’ (ability to strike hardwood cuttings) pear varieties made by Helmut Jacob, at the Research Institute and College, Geisenheim, Germany, but has only inherited some of the ‘Old Homes’ fireblight resistance. However, it has been reported that this variety produces severe suckering with spiny shoots, as well as causing reduced fruit number (T. Auvil, WTFRC). Source: orangepippinstrees.com. All commercial cherry trees are made up of two parts: the upper fruiting portion (grafted or budded scion wood); and the lower portion ( the rootstock). Until fairly recently, the majority of breeding efforts were directed towards fruit improvement. Over the past century, breeding programs have concentrated mainly on achieving improved characteristics such as yield, taste, fruit size, fruit firmness, fruit color, precocity, and resistance to fruit cracking and disease. In contrast, rootstock development has only recently received breeders attention. It is believed that ‘Mazzard’ seedlings are the oldest known sweet cherry rootstock dating back to the early Greeks and Romans. And this is still the most widely used rootstock for sweet cherry throughout the Pacific Northwest. Many of the newer rootstocks are described using Mazzard as a standard for comparison. Recently, several new rootstocks have gained prominence for their improved attributes. Many of these are semi-dwarfing. Some of these may impart some disease resistance, induce precocity (bearing younger, and lend themselves to use in high-density plantings. There is an excellent PNW Extension publication by L. Long and C. Kaiser reviewing the performance of the major sweet cherry rootstocks grown around the region. (download pdf PNW619) Listed below are many of the sweet cherry rootstocks available for use in the Pacific Northwest. Relative size comparison chart of several rootstocks being evaluated by Michigan State University and Washington State University. More information about this graphic can be found in this Good Fruit Grower article. Listed below are many of the sweet cherry rootstocks available for use in the Pacific Northwest. Click on the heading to view details about each rootstock. A fibrous root system makes Mazzard a good choice for wet and heavy soils. Mazzard is the most popular cherry rootstock grown in North America. It is generally more vigorous than Mahaleb, especially in poorer soils. Performs in deep soils with good drainage. This rootstock is somewhat dwarfing, cold hardy and precocious. Deep rooted. Not recommended for heavy soils or areas with high water tables. A popular introduction in Germany, this rootstock produces a very precocious tree approximately half the size of trees grown on Mazzard rootstock. It produces an open, spreading tree with wide angles. It is quite virus tolerant and does well in heavy soil. Trees grown on Gisela® 5 may need to be supported. Some suckering may occur depending on growing conditions. It is very hardy and produces well. It is compatible with most varieties. It has shown good results in Washington State. A semi-dwarf rootstock that produces a tree slightly smaller than Mazzard, roughly 80 to 90 percent. A good substitute for Mazzard, Gisela® 6 is well suited for heavy soil types. The tree structure is very open and round. Very precocious despite its vigor. It appears tolerant to many cherry viruses and is not prone to suckering. Anchors well, but may need support, especially in the first fruiting years because of its precocious nature. A precocious, semi-dwarf cherry rootstock, yielding a tree about 60% of one grown on Mazzard. Produces a tree that is spreading and open. Resists suckering, is well anchored but may require support. Good anchorage and vigor. Heavier soils okay. Clay loam. Very vigorous, smaller than Mazzard. NOT COLD HARDY. Reduces tree size by 20% to 30% compared to those grown on Mazzard. Non-suckering trees. The rootstock is precocious and compatible with all cherries. Sensitive to Prunus ringspot & Prunus dwarf virus. Reduces tree size by 20% to 30% compared to those grown on Mazzard. Tolerant to water stress and easy to propagate by softwood cuttings. Sensitive to Prunus ringspot & Prunus dwarf virus.